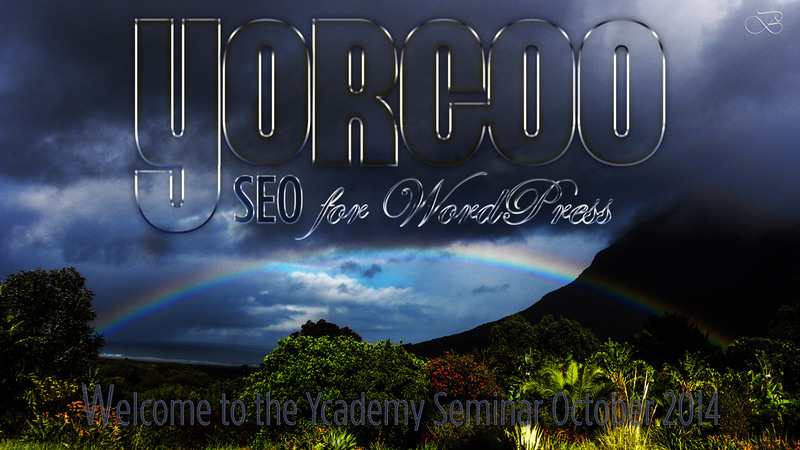 Search Engine Optimization (SEO) on WordPress powered websites and blogs were the keynote topic at this month’s Seminar by Ycademy (October 2014), following last month’s workshops on membership sites and community building with YORGOO. Due to Google’s change in algorithm and the resulting confusion and panic with Panda first, followed by Penguin 3 just a few weeks ago, we all have to learn new tactics and strategies to stay ahead of the game in terms of top rankings on Google, namely the first three positions. This article HERE may give you some valuable insights in case you disappeared from the radar or lost important positions in terms of ranking. Clearly, for us at Web Design South Africa it means an update of our self-hosted WP websites and author blogs, and those of our customers. Not to forget the recent WordPress update to 4.0. As Semiomantics Experts, our main goal has always been to rank our customers’ websites on top of Google’s first page – and we were smashingly efficient at that with ample proof. Why would we want to be visible – ideally as one of the first entries – on the first page showing the search term? Very simple: if someone looks up a keyword or a keyword string on the search engine, the first page that opens always shows 10 posts to the left, meaning articles written under that topic and title, and – if a popular keyword is targeted – lots of AdSense Ads by Google on top, to the right side and sometimes even underneath the articles. So anyone looking up a specific term will most likely find what he is looking for right here. This means traffic, i.e. visitors to a website. Who has the time to venture on to pages 2 or 3 – never mind 1000 or one million? Nobody right in their mind! So there’s a clear message and goal for anyone wanting to be found in order to sell a product or service or someone else’s product or service – as simple as that. However, there is a choice: either one achieves this kind of visibility by paying heavily and continuously for Google Ads – where each click means U$ and no guarantee for a sale – or one finds a good website designer who not only creates an attractive website with all the features needed, but who can also rank the website. However, ranking a website is an ongoing effort as the competition for one of these 10 positions is stiff – it’s the Formula 1 of the web! No wonder that companies invest heavily in their SEO specialists – either inhouse with juicy salaries, or paying U$4,000 to U$5,000 and more a month! But it pays: imagine you sell cars for U$20,000 a piece. What difference to your business would it make if you were getting more traffic, meaning more people interested in your cars – and buying? If you sell just one more car per month you’re a winner… and with a well-ranking website you may sell more! We’re seeing peoples’ sales and profits literally exploding online – especially since the mobile web. So do your maths and invest in a good website to build your visibility and reputation on the Internet – and then hire someone who knows how to position it on your chosen keywords, ideally your website designer him/herself. This is an Art, it’s not done overnight – but once you’re there, you’re off to the races and you can watch your traffic soar! All this and more was the exciting material we went through at the October Seminar by Ycademy… in preparation also for YORGOO! It’s all happening!